Join us for "Birdies for Buddies" golf tournament benefiting prostate cancer research. Prostate cancer is one of the leading causes of death in men. Too many of our family members, friends and colleagues have had to fight this battle. Let's stand with them and chip in to fund prostate cancer research. Since 2013 Birdies for Buddies tournament held at Double Eagle Club raised over $1,540,000 to benefit Prostate Cancer research at the MD Anderson Cancer Center Foundation and Ohio Health foundation's prostate cancer research. The 2018 tournament sponsors were: OhioHealth, MD Anderson Cancer Center and Worthington Industries. The tournament will continue to be a scramble with handicaps between four person teams. Membership at Double Eagle is not required and we will accept individual participants. Overnight accommodations are available, but they are limited and will be on a first-come, first-served basis. Thank you for your continuted support of this tournament. Congratulations to the 2018 Birdies for Buddies Champions, Zack Krichbaum, Sam Mason, Jason Miller and Rich Pinson. They shot a 53.4. The runners-up were John P. McConnell, Ross Lykins, John H. McConnell and Chris Miller. The 18-hole "Double Eagle" course at the Double Eagle Club facility in Galena, Ohio features 7,255 yards of golf from the longest tees for a par of 72. The course rating is 74.8 and it has a slope rating of 140 on Bentgrass. Designed by Jay Morrish, ASGCA/Tom Weiskopf, the Double Eagle golf course opened in 1992. The OhioHealth Foundation is dedicated to helping our central Ohio family of faith-based, not-for-profit funds to support many important programs and services. All earnings are re-invested to improve patient care. Worthington Industries was founded in 1955 and today employs more than 10,000 people and operates 83 facilities in 11 countries. The leading diversified metal manufacturing company had 2015 fiscal year sales of $3.4 billion. The Columbus, Ohio based company is North America's premier value-added steel processor and a leader in manufactured pressures cylinders and custom engineered open and enclosed cabs and operator stations for heavy mobile equipment. 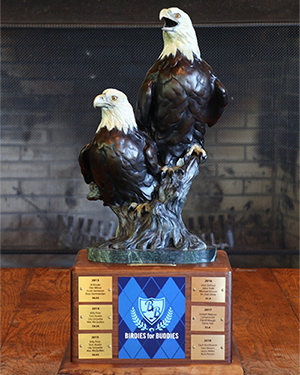 BIRDIES far BUDDIES is hosted at the Double Eagle Club, a private club located at 6025 Cheshire Road, Galena, Ohio. The 18-hole course features 7,255 yards of golf from the longest tees far a par or 72. The course rating is 74.8 and it has a slope rating of 140 on Bentgrass. The course was designed by Jay Morrish, ASGCA/Tom Weiskopf and opened in 1992.